As a developmental geneticist by training, Ottoline Leyser might have studied animals. But plants' ability to tune their development to their environment won her over completely. 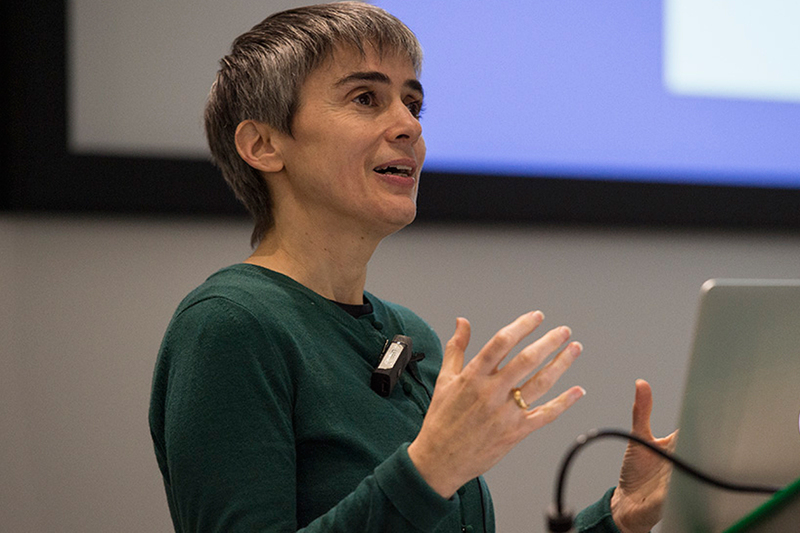 “I have always been drawn to plant systems because, unlike animal systems, plants have this extraordinary developmental plasticity,” Ottoline Leyser told a seminar audience at Rothamsted Research today. “The same genotype can give rise to an extraordinary range of different phenotypes depending on the environmental conditions in which the plant is growing,” said Leyser, director of the Sainsbury Laboratory at the University of Cambridge. It was an engaging introduction to the work of her research team, a talk that was streamed live from the Rothamsted Conference Centre before a large audience of senior researchers and PhD students, and is now available on the Institute's YouTube channel. “The model that we work on to try to understand this process is the regulation of shoot branching in Arabidopsis and, in particular, we use Nitrogen supply as a really easy-to-manipulate environmental variable,” noted Leyser. If two buds are growing, they are in competition: “You can almost see them arguing with each other about who gets to grow…there is this communication between them – and this is an important lesson for life,” said Leyser. Leyser described the plant model as “a very sensitive system for tuning growth and bud activity”, and is a system based on competition and reinforcement. “And competition and reinforcement is really a very well-known self-organising design principle, which, for example, is the thing that re-wires your brain, it re-wires the synapses in your brain, according to how often they’re used, according to the environment. After the seminar, we recorded a video interview with Leyser (linked here), on the role of agriculture in the government’s new Industrial Strategy, which was announced the following week. For more on the strategy, go here.